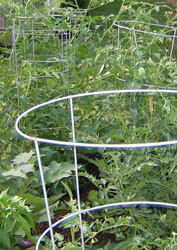 If you've grown tomatoes before you may have tried using tomato cages resembling the common three-foot galvanized ones pictured below. I don't know about your experience but I've always had trouble with these cages. The generic cages may be adequate if growing bushy-type determinate varieties. 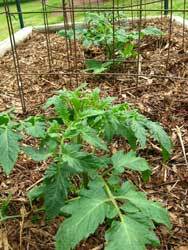 But when growing indeterminate tomato varieties they are usually too short and the vines too soon sprawl out the top and onto the ground. Sometimes the cages are too light and fall over from the weight of the vines and fruit or don't offer enough support when the wind blows. Others have told me they're experiencing the same kinds of problems with these cages. Why go to the bother of using cages then? If you want more substantial cages than the cheap common variety you have the options of buying a commercial cage or making your own. You can be frugal and build cage-like structures from scrounged or recycled materials. I've seen teepees made of wood, metal poles, and bamboo. When you visit community gardens you'll see lots of original contraptions. A popular technique for building a very sturdy encircling cage is to make one out of concrete-reinforcing wire mesh having six-inch openings. This material is not expensive and will last for many years. 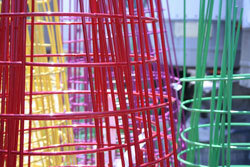 Read how to build a tomato cage for detailed instructions.